"Universal Closer - Adjustable Sizes 1-6"
- Arm Option: EDA (Extra Duty Arm). - Select Finish: Light Bronze (691), Brass (696), Dark Bronze (695), or Aluminum (689). - Select Closer Cover: Slim Line Cover (Standard) or Full Cover. - Delivery: The LCN 1461 EDA Surface Mounted Closer is factory-ordered, please allow 3-5 working days' lead time. The LCN No Leak Commercial Series Closers are designed especially for the unique opening needs of the commercial market. Each of the closers in the No Leak Series features solid, cast iron cylinder construction and special V-Shield™ sealing technology; so your closers are guaranteed for 10 years not to leak even under the most demanding conditions. The LCN 1460 Series closers are designed for maximum versatility. They can be used for a variety of both commercial and institutional applications and have multiple cover options available. The 1460 Series includes the LCN® "Green Dial" Spring Force Indicator. 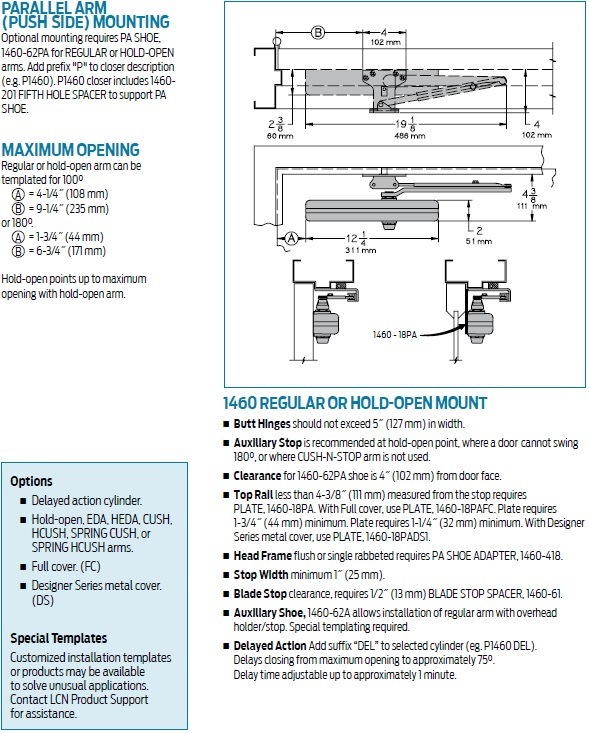 - 1000 series closers mount three ways. 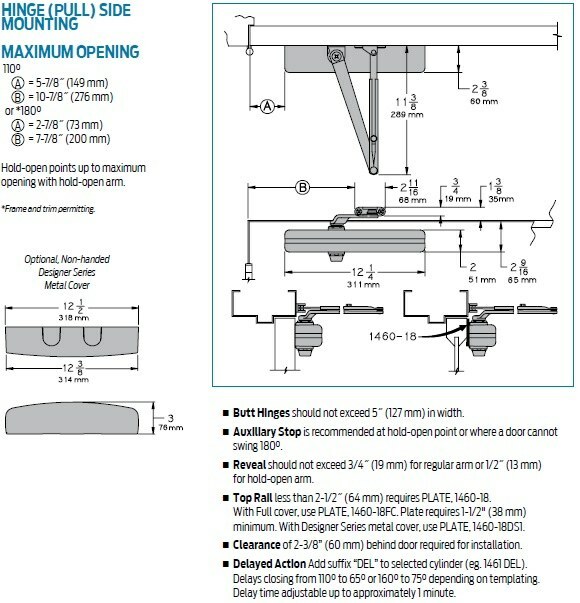 Closers with regular or hold-open arm mount hinge side or top jamb. Parallel arm, designated with a "P", closers include - 62PA Shoe required for parallel arm mount. 1460T mounts hinge side, top jamb (pull side) and stop face. - Non-handed for right and left swinging doors. - Closers to meet ADA reduced opening for requirements. - Adjustable hydraulic backcheck cushions opening swing prior to 90 degrees. - Separate regulation of general closing speed and latching speed. - Joints in arm and shoe adapt to uneven trim. - Reversible shoe to boost latching power on double lever arms. - Available in Aluminum (689), Dark Bronze (695), Brass (696) & Light Bronze (691) finish. The 1460 Series is UL and cUL listed. Tested and certified under ANSI Standard A156.4, grade one. - Standard 1460 Series closer shipped with regular arm, a slim lin plastic cover, and self reaming and tapping screws. - Mulitple cover options include; Standard (Slim line), Full and Designer Series. - Non-sized (1-6) cylinder is adjustable for interior doors to 5'0" and exterior doors to 4'0". - Closer mounts hinge side, top jamb and parallel arm on either right or left swinging doors. - Closer meets ADA requirements. - Tested and certified under ANSI Standard A156.4, grade one. Rw/PA (Regular Arm 1460-3077): Non-handed arm mounts hinge side or top jamb. Includes PA SHOE for parallel arm mounting. Hw/PA (Hold-Open Arm 1460-3049): Optional, non-handed arm mounts hinge side, top jamb or parallel arm. Hold-open adjustable at shoe. EDA (Extra Duty Arm 1460-3077EDA): Optional, non-handed parallel arm features solid forged steel main and forearm for potentially abusive installations. 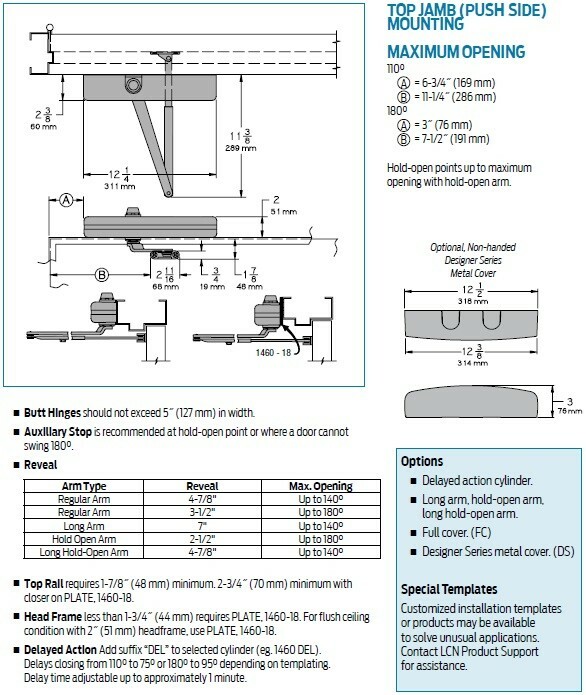 CUSH (Cush-N-Stop Arm 1460-3077CNS): Optional, non-handed parallel arm features solid forged steel main arm and forearm with stop in soffit shoe. 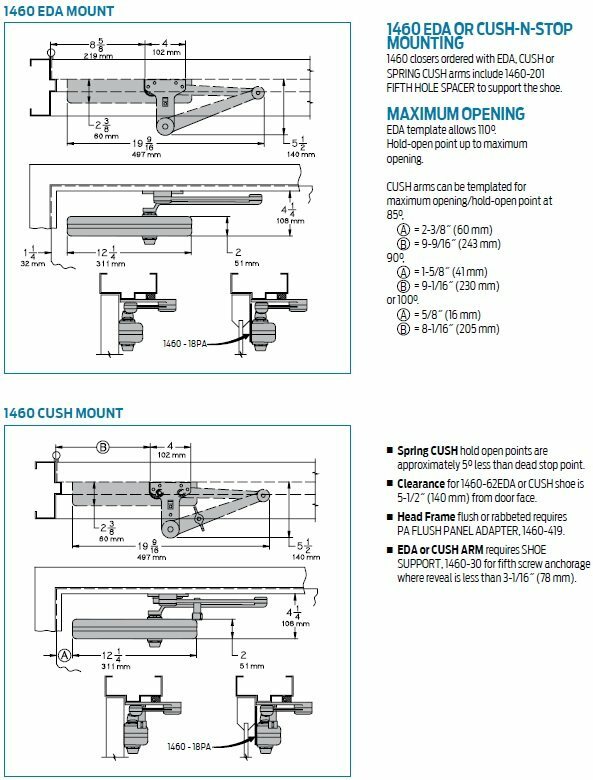 HCUSH (Hold-Open Cush-N-Stop Arm 1460-3049CNS): Optional, non-handed arm provides hold-open function with templated stop/hold-open points. Handle controls hold-open function. SCUSH (Spring Cush-N-Stop Arm 1460-3077SCNS): Optional, non-handed parallel arm for abusive applications features solid forged steel main arm and forearm with spring loaded stop in the soffit shoe. SHCUSH (Spring Hold-Open Cush-N-Stop Arm 1460-3049SCNS): Optional, non-handed parallel arm for abusive applications features solid forged steel main arm and forearm with spring loaded stop in the soffit shoe. Handle controls hold-open function. Special Order Information: For pricing on any finish or non-standard option of the LCN 1460 Series Closers not found on this page please contact Taylor Security direct via e-mail (sales@taylorsecurity.com) or call us toll-free at 1-800-676-7670.